Accessory for dressing kimono indicates an auxiliary item which cannot be seen from outside among the accessory used when wearing kimono. 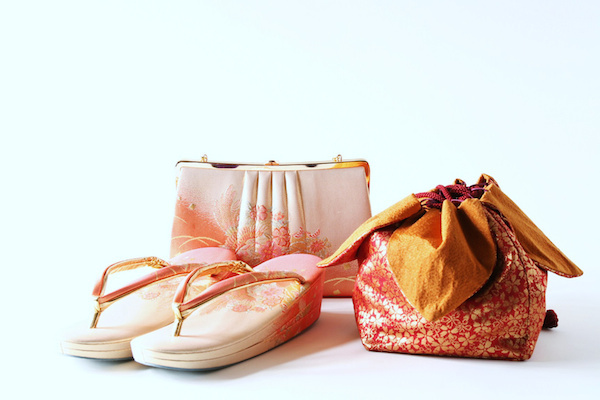 Though a variety of items are used according to the style of those who dress kimonos, the necessary items are basically waist strap, Datejime, batten plate and sash pillow, and the other special items are the modification of basic items. Waist strap is a strap to fix the kimono to the body. One is literally fastened around the waist, the other one is also fastened at the chest not to flutter the collar. The strap fastened at the chest is called Munehimo, which is the same shape as waist strap. Though waist cord is only for kimono, chest cord is used for both singlet and kimono, and also the cord is used for auxiliary cord when fastening each cord, which means 4 cords are needed in total. Datejime is cord to fasten above the chest cord, whose role is to keep the collar part from getting out of shape and to cover the knot of chest cord and loosen cloth. Since it is used for both singlet and kimono, 2 cords are needed in total. Cord plate is used to prevent the front of the cord from wrinkling. Sash pillow prevent the cord from getting down by forming a drum base, and it is not used for half-width obi.